As we follow the story of the Datatron from its origins within Consolidated Engineering Corporation, through its initial sales under ElectroData Corporation and into the Burroughs organization, one interesting name keeps showing up: Sibyl Rock. She is always looking out for the customer, the programmer and the user. She deals comfortably with customers, engineers, technicians and management. Just who was Sibyl Rock? Born on August 1, 1909 in Butte, Montana, she grew up there and in Denver and in Los Angeles. Her father was a telephone technician in Montana and Colorado and that may have helped form some interest in technology. She attended UCLA where she completed her degree in Mathematics in 1931. She was president of the local chapter of Pi Mu Epsilon, the national mathematics society. She also picked up her Phi Beta Kappa key along the way. Sibyl Rock joined United Geophysical Company in 1938. She later transferred into United's engineering and instrument subsidiary, Consolidated Engineering as they began to develop the Mass Spectrometer. Rock's work there in the 1940s was significant enough to deserve a mention among those planning a 2002 presentation at the American Society for Mass Spectrometry. She was instrumental in developing the mathematical techniques for analyzing the results from Mass Spectrometers and assisting Consolidated's customers in the use those techniques and the use of Cliff Berry's analog computer. Rock devised many of the procedures of mixture analysis and wrote the computing manuals. She did basic analysis, under the direction of the National Bureau of Standards, of the first smog samples. She was officially in research until 1947 and then in sales. This put her in close contact with the decision makers at various chemical and refining companies who would later be purchasing some of the first digital computers. 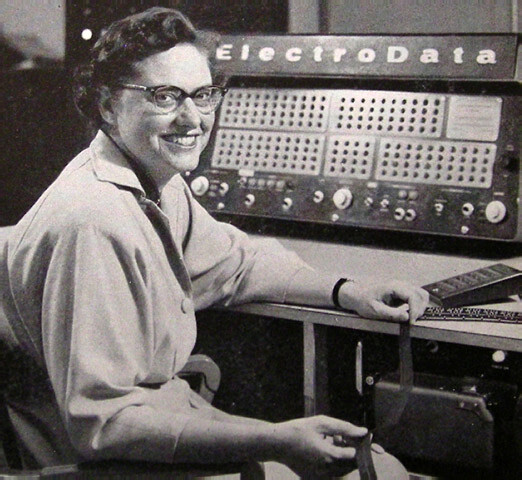 Her survey of CEC customers and trade organizations in early 1952 confirmed the immediate potential for the Datatron in commercial markets. More importantly, it established a minimum word size for the machine early on in the project. Continued discussion with CEC scientific customers in late summer of 1952 established the importance of reliability, service and ease of programming in the eyes of potential customers. She developed the brochures and command lists that impressed potential customers even though no machine yet existed. Her "competitive analysis" and knowledge of the customer base helped to establish pricing that was effective for both CEC and their customers. She worked closely with Dr. Ernst Selmer on coding problems for the machine before it even existed in hardware. This helped the instruction set to evolve. She taught coding classes to the engineering staff and to early customer personnel. She maintained contact with existing CEC customers and made presentations at professional organizations to keep the CEC machine in the front of customer minds as alternatives began to appear. She encouraged potential customers to try coding problems for the Datatron, helped them with the coding and then saw to it that the problems ran on the "breadboard" and "prototype" systems. She was personally responsible for several of the early Datatron sales to customers such as Socony Vacuum, the National Bureau of Standards, Purdue and Shell Development Corporation. For the past several years I have written Product Specifications for digital computers and related peripheral gear. The engineering design is done by engineers. The Product Specification forms a "contract" between engineering and marketing to assure that both interested parties know what is to be built. Because the engineer may be too optimistic as to what he can produce and what reliability he can achieve, and because marketing wants the moon for zero dollars, the product specification writer is needed as a negotiator. Whenever our past procedures have been more difficult than IBM's we have been at a disadvantage. I submit that our experience tells us that operational and performance features known to be inferior to IBM's present designs should not be permitted on our future units.